Forget about the Hollywood Poker Ring. It’s about to get upstaged by the unearthing of something even more salacious. Yep. Start stocking up on garlic, silver bullets and twinkies now folks. Recent pictures have shown irrefutable evidence that Hollywood has secretly been hiding another animal alltogether for years now. Ladies and Gentlemen, get ready for the exposure of the Hollywood UnDead Ring! 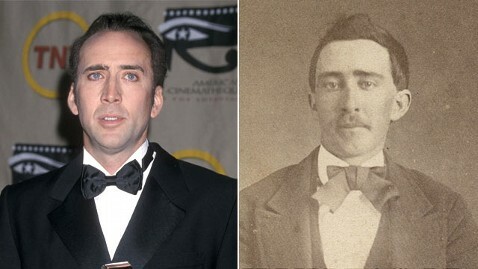 Nicholas Cage and John Travolta have recently been exposed. Former Buffys Sara Michelle Gellar and Kristy Swanson are teaming up to bring justice to Hollywood! Rounding out the trio, none other than Queen Latifah. Her resume doesn’t include slaying vampires but they wanted her to help for her reputation as a badass in general. Together, they form Donald’s Angels! Yep, Donald Sutherland is the mentor and brains of this operation. Sources also say that due to the type of attack we think may be planned, government forces have also been enlisted. Suspicions are heavy that the Capitol has already been infiltrated, so it seems the best plan of attack would be to have defenders here as well. The Zombieland Crew. Jesse, Emma, Woody and Abigail are back with a vengeance! Stock up on your twinkies now. Bill Murray. Double Agent: Ghostbuster and Zombie Impersonator. Christopher Walkin. I’d sure want him on my side anyway. Al Pacino. The Godfather knows how to make offers they can’t refuse. Johnny Depp. Can’t cheat Captain Jack Sparrow. Savvy? Daniel Radcliff. The Boy Who Lived. Uma Thurman. Kill Bill 3, kids. No new evidence has been found yet, but suspects include: PeeWee Herman, Tom Cruise, Kirsten Dunst, Amber Heard, Brad Pitt, David Arquette, Ralph Fiennes, everyone on True Blood, half the cast of Twilight, and Nancy Grace.